The archetypal rock drummer and without doubt Rainbow’s best and most influential drummer. His influence on pushing Blackmore to keep striving for better and better songs only waned once Blackmore decided he wanted commercial radio success, particularly in the USA. Powell effectively handed in his notice upon being forced to record ‘Since You Been Gone’ – so he played it twice in the studio and refused to record any more takes. Powell fulfilled his commitments to complete the tour dates supporting ‘Down To Earth’ throughout 1980. His final Rainbow gig was the inaugural Monsters Of Rock festival at Donington on 16th August 1980. His soundcheck included a pyrotechnics test (for his infamous 1812 Overture drum solo) which promptly blew up the PA system, causing around £18,000 worth of damage. Following Rainbow, Powell played in a series of major bands including Whitesnake, Black Sabbath, MSG, Emerson Lake & Powell. Cozy Powell died on 5 April 1998 following a car crash while driving his Saab 9000 at 104 mph (167 km/h) in bad weather on the M4 motorway near Bristol. According to the BBC report, at the time of the crash, Powell’s blood-alcohol reading was over the legal limit, he was not wearing a seatbelt, and he was talking to his girlfriend on his mobile phone. The official investigation also found evidence of a slow puncture in a rear tyre. It was suggested that this could well have caused a sudden collapse of the tyre with a consequent loss of control of the car. Great site and great post. I am fortunate to have met Cozy Powell after a gig in Aberdeen in 1992 (I think). 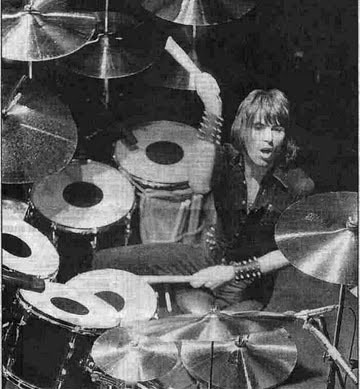 What did I make of Cozy Powell the man. True gent. Signed autographs, spoke to fans, happy to mingle with the crowd. Shorter in height than what I was expecting but just as large in life. Legend. The greatest drummer of them all. I saw Rainbow back in 1977 with Cozy Powell,amazing drummer,I still have cozy’s Ludwig drumstick from that gig at granby halls Leicester,treasured memories. Saw him with Rainbow in Sydney Oct 1976 , wow WOW wow…No words can describe that concert and his drumming just blew us all away. 41 years later still the best concert I’ve ever seen.